I’m not an admirer of the moé aesthetic, so my initial response to Sora no Woto was one of indifference; just more moé, I thought; not interested. That’s always my default reaction to a series like this, but the thing is, life’s not that simple. Genre is a superficial excuse; no single story is the same as another, and despite my misgivings, Sora no Woto was beginning to look more and more interesting with each passing week. Well, inevitably, last night I caved and watched its first three episodes. In the second, the young Kanata and Kureha venture into a derelict high-school. Wandering through its empty halls, they find old papers strewn across the floor, the walls torn apart, desks thrown any which way, carefree students pictured in mouldy old photographs, dressed in typical uniform; evidence suggesting a society not unlike our own, a society long since lost. The girls are protected by what feels like the last remaining sanctuary of their country; the only place where youth and naivety are still able to exist, and that feeling of moé, of innocence, is woven beautifully into a world on the brink. In a way, it’s like Haibane Renmei, where quiet, hazy days are fritted away on mundane tasks, yet the undercurrent of sadness is palpable. The direction is conflicted, like someone simultaneously celebrating youth yet lamenting its transience and fragility; nostalgia, perhaps? It’s as if the faintest of touches could shatter these girls’ into a million tiny pieces, and that sense of vulnerability is foreboding and melancholy. Where Sora no Woto goes from here will be interesting. There is potential for tragedy and heart break, but perhaps it’s just content with being what it is right now? A bitter-sweet lament. Heheh 🙂 The thing about Sora no Woto is that I enjoy its strange juxtaposition of ‘cuteness’ and ambiguous ‘darkness.’ I’m not convinced I’ll get that from any other moé series, which isn’t a failing of them, really, but rather just my taste in anime. Anyway, we’ll see; I must admit that watching this has given me renewed impetus to finally pick up The Melancholy of Haruhi Suzumiya! You’re a braver man than I. I do WISH I could get over my grievance with “moe,” but it’s just so hard. Some of these series are just painful to watch, so I’ve grown to the point where I don’t even want to look anymore. It really has nothing to do with the aesthetic, just the overall feeling of blatant pandering and characters who act like they have borderline Down Syndrome trying so hard to be “cute.” In essence, I guess I mainly hate the “trying too hard” aspect of the genre and the often annoying results it renders. I know exactly what you mean; fans like watching moé girls doing ‘cute’ irrelevant stuff, so perhaps the problem with moé anime is that it’s so often framed as slice of life, giving the creators free reign to be as voyeuristic as possible? I agree that, at its worst, moé is extremely leery and unnatural. 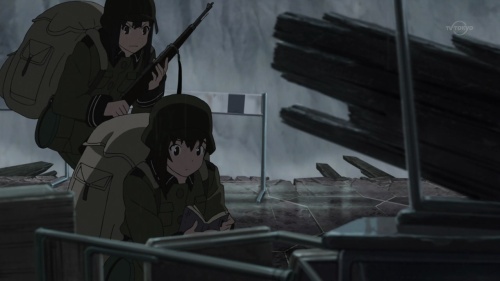 Even still, I don’t think Sora no Woto is that bad. The cuteness and naivety is framed in a way that makes logical sense, as if I’m watching something with a real story, as opposed to just irrelevance. It is what it is? I don’t think I can talk to you anymore. Dude, two posts before this is a post about Vikings: we’re all about the diversity on this here blog. What is the “moé aesthetic” to you, and why does a superficial glance factor that much into your decision of watching shows with that or not? I don’t prescribe to the notion that moé is subjective, rather, I see it as a genre and as an aesthetic (of anime) popularized by the likes of Kyoto Animation. That concept is what I had in mind when writing the above about Sora no Woto, so when I look at a show like Kanon or K-ON!, I see moé anime, too. My problem is that moé is, at its worst, leery, unnatural and forsakes logic in favour of cuteness. I can’t stand the pandering, and I can’t lose myself in a story that makes no sense. That “superficial glance factor” protects me from all of this, because my opinion is that moé anime is superficial anyway; Sora no Woto was different because the art is evocative and has ‘depth’; it looks like it’s about more than just the girls. Apparently the original character designs are a lot less like K-ON! and therefore less moe. The decision to make them what we see is regrettable. First of all, we all agree there’s too much moe (though I don’t want to banish it forever), and second, the reputation it gave the show even before it came out is unfair to this odd little series. The military trappings, the memories of the war, and the customs the characters follow make a rich, full world I’m looking forward to learning more about. Furthermore, apart from the character designs it looks fantastic, and I’m loving the pace and what it shows about the characters, like the long pause where Kureha pauses by the emergency phone, silently begging it to ring. I wish people would look past the look of the characters. The sheer outcry from fandom after that first episode seems surprising now, but I guess that’s just the way people can be, superficial to the core. It’s especially bad at the beginning of each season because reviewers are so anxious to get their impressions online as soon as possible, and it’s easier to just look at Sora no Woto and scream “moé” than to actually stop and think about it for a while. I think everyone judges a book by its cover – be it a good defensive mechanism or a poor judgment call. I think that’s where the thoughts of others who are similar to you (and those you respect) come in handy. If Sora no Woto had turned out to be another K-ON!, you would have DIED watching even one episode of it. Having learned that Sora no Woto is different, you’re giving it a shot to find something more in the story. On a completely unrelated topic: I found your blog through Scamp (The Cart Driver) and I have to say that your language structure and use of vocabulary (and proper punctuation) is FANTASTIC. I could have sworn you’ve seen Haruhi already. I think you’d enjoy that one. Even I enjoyed that one to extent, albeit not at all as much as most people. There’s no denying it’s a uniquely-crafted show, and there’s also the parody factor. It parodies lots of concepts (such as information-overload, or the episode where nothing happens), character archetypes (such as the quiet mysterious girl, or the “moe” girl), and series (such as Evangelion, Touch, LOGH, even itself). I would have enjoyed Haruhi a lot more if I didn’t hate most of the characters. Haruhi got on my nerves, Kyon was okay in the beginning but I just wanted him to shut the hell up after a while, and I especially hated Mikuru even though I understand that she was a character archetype parody (moe). And I have no idea what so many people like about that laughing girl. So yeah, it’s worth a try though. If you could stand the characters then you’ll most likely enjoy it more than I did. I know where you’re coming from with this one. I enjoyed Lucky Star and I’m also enjoying K-On!, two of the most notoriously moe shows around, which surprised me. I shouldn’t have been surprised really since I watched them for reasons other than those that make them commercially popular: Lucky Star was subversive in its humour and as for K-On!, it has the slice of life and music things but the cutesiness means the characters might as well be talking cats or something. I wouldn’t call them favourites of mine and wouldn’t go as far as recommending them to you but they still provided more on their own merits than being merely that fan pandering fluff that’s causing such a backlash. Sora no Woto is an interesting case (the director’s worked on Elfen Lied and Baccano!). It amazes me how quickly people jumped to conclusions purely on the character designs and production – maybe I’m more immune to this because I pay less attention to studio and more to individual staff than some. KyoAni productions are so heavily loaded with preconceptions that perhaps we shouldn’t be surprised that as soon as they deviate from whatever opinions fans have, inevitable nerdrage follows. The more I hear of the series’ mixed reception, the more I want to see what the fuss is about. I have yet to see Baccano!, but with the sense disgust and disdain I maintain toward Elfen Lied, I must say that I’ve been quite reluctant to give this one a look, even if people are likening it to Haibane Renmei, which is one of those rare cases of the moeblob aesthetic being acceptable to me as everything else about it is simply wonderful. I do not care for the moe aesthetic myself (which is probably better described here as the “moeblob aesthetic,” as “moe” can also describe things I like, such as Gunbuster, or a character like Schierke of Berserk—the concept of “moe” and the “moeblob” blandness of character design and aesthetic prevalent in so much anime these days are apparently different things, but I digress), or “fan-pandering fluff” as Martin puts it. Or, “at its worst, moe is extremely leery and unnatural.” I’m glad that I’m not alone in feeling this way, because my proximity to fandom (being a user on sites like MAL, plus being marginally aware of 4chan’s internet-wide influence) I find myself feeling disturbingly outnumbered at times. And I don’t care to see any more shows “parody” these clichés (a la Haruhi or Bakemonogatari), because this really strikes me as a thinly veiled attempt at “cleverly” disguising its pandering nature while … still pandering, and still being clichéd. I’m not buying it. This is what we call bad art, kids. Fandumb simply won’t understand this. HA! You took the words right out of my mouth. While I do enjoy a good parody every once in a while, even THAT has become a fan-pandering forced cliche these days, and I’ve stopped buying it myself. Maybe it’s not such a clever disguise after all. Then again…the fandom eats it up, and as long as that’s happening these shows will never end. B-but the voice acting is horrible, and not to mention, so stereotypically moe! Sora no Woto is a mixed bag for me. There are some very nice aspects about it, but the moe aesthetic sometimes breaks my suspension of disbelief. Which is chiefly caused by Kanata and her incompetence that feels more like contrived exploitation than genuine idiosyncracy. From the beginning she has an ear for music to the point of recognizing random notes in a song, yet she couldn’t play a damn instrument? She’s in rapture for trivial stuff, nevertheless can’t notice a large dinosaur-like fossil? Sorry, but that crosses the breaking point of my suspension of disbelief. It’s not even a bittersweet lament … just … wasted potential and fence sitting.